Variously known as the "kaftan", "nabob" and "norex" [after Norex Holdings (Pty) Ltd] fence along portions of the Zimbabwe and Mozambique borders was erected in phases in the mid-1980s and replaced an earlier natural hedge of sisal plants sown between 1980 and 1983. The "Norex" electric fence border security device, built in 1984 and 1985, consisted of two razor-wire barrier fences flanking a pyramid of coiled razor-wire that shields a series of electrified wires, which pre-1990 were set to administer a lethal shock. South Africa secured the land borders by two electric fences: Norex 1 from Komatipoort to Mbusini on the borders of Mozambique and Swaziland and the 137 km long Norex 2, which stretches from the Sand river (near Messina) almost to the Botswana border. 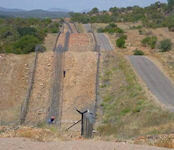 Another fence along the Zimbabwean border had been proposed. The design is roughly consistent all along its 268km northern span from a farm known as Eendvogelpan, about 20km east of the Pontdrift border with Botswana, to the northern Kruger Park border with Zimbabwe, as well as its 62km length from Komatipoort, on the southern Mozambique border to Jeppe's Reef near Swaziland. The Norex electrical fence stops at the Sand River, which is east of Beit Bridge. This is also the shortest distance from Beit Bridge to Messina and is often used by illegalimmigrants who prefer not to cross the Norex electrical fence. The Kruger Park, which has electrified animal fences, is a border category unto itself. Vhembe is a 32 kilometer long traditional crossing point between Zimbabwe and South Africa. This is also the area where the Norex electrical fence was not erected, as it would have infringed on a migration route of elephants in the area. Along 225 kilometer of borderline with Zimbabwe, starting at the Sand River just east of Messina up to the Alldays area, the Norex electrical fence marks the borderline. There is a gap of approximately 32 kilometres in the Norex fence at the Vhembe area. The Norex fence is manned by military personnel from the SMA who are stationed at substations every ten kilometres along the border. One to two soldiers are deployed at each substation. When interference occurs on the fence, which is set on alarm mode, it will register at the substation closest to the interference, at the SMA headquarters, as well as at the offices of the contractor responsible for the maintenance of the electrical fence. The electrical fence was severely damaged during the 2000 floods and is under repair, placing an extra burden on funds and personnel to maintain the same level of readiness. The rest of the borderline east of the Sand River follows the Limpopo River, and consists mainly of farming lands. In this area, sisal plants formed a barrier in the past, but these were cleared to make way for an extension of the Norex electrical fence. However, it was never erected because no funds were available to do so. The sisal barrier was also very badly damaged by elephants and monkeys eating the plants. It is debatable whether the sisal ‘fence’ was ever really effective. The South African Defence Force, a precursor of the reformed South African National Defence Force (SANDF), reported that these electric fences caused 89 deaths between August 1986 and August 1989. A 2001 Centre for the Study of Violence and Reconciliation study proposed a figure of at least 100 deaths prior to February 1990, when the fence was finally turned to non-lethal alarm mode. Attempts by the SANDF to effect basic repairs to the fence at Beitbridge had proved largely unsuccessful by 2011. The SANDF was tasked by government in May 2010 with resuming police duties along the Zimbabwe and Mozambique borders as part of a R135-million exercise named Operation Corona. Meanwhile, the border fence continued to be trampled, cut and burrowed beneath by smugglers, poachers and migrants illegally moving across the border. Major contracts under Grintek Security Systems’ belt include maintaining and upgrading NOREX I (the Northern border of South Africa), installing complete security fence systems for numerous clients including De Beer’s Venetia Diamond mine and Leopard Creek private game park, and maintaining the access control system, intercom and CCTV systems for the SANDF and Armscor on project BAIL. It also secured the contract for the Kuwait/Iraq border security system, beating out international players. This is currently the largest system of its kind worldwide. As part of cleaning up the mess, the department redeployed engineering troops to try and close the holes in the fence. In other parts of the borders, the fence was cut while in other areas, illegal immigrants had dug under the fence to gain access to the Africa’s economic hub. The roads in the border areas were riddled with potholes, mountainous and dusty roads which were making it difficult for them to travel. They also discovered that the razor wire fence was riddled with holes as a result of forced entries by illegal immigrants. The conundrum was compounded by the syndicate which smuggled cars into Mozambique . “ The scale down the fence so they could drive their stolen vehicles out of the country.”. To make things easier for themselves, these riff raffs use local villagers houses to hide the stolen goods and pay them between R1000 and R2000 a car. On 19 February 2012 Justice and Constitutional Development Minister Jeff Radebe announced that South African National Defence Force (SANDF) members, working in conjunction with other law enforcement agencies, will be deployed to various borders in an effort to strengthen borderline security. "The deployment includes army engineers who are conducting repairs and maintenance on the Zimbabwe / Mozambique border fence (approximately 140KMs)."